^ 1.0 1.1 1.2 Kister, KF. Kister's Best Encyclopedias: A Comparative Guide to General and Specialized Encyclopedias 2nd. Phoenix, AZ: Oryx Press. 1994. ISBN 0897747445. ^ 4.0 4.1 4.2 4.3 4.4 金常政. 百科全书的故事. 北京: 北京图书馆出版社. 2005-03. ISBN 7501326231. ^ 5.0 5.1 5.2 5.3 Kogan, Herman. The Great EB: The Story of the Encyclopædia Britannica. Chicago: The University of Chicago Press. 1958. LCCN 58-8379. ^ 6.0 6.1 Encyclopædia. Encyclopædia Britannica 14th edition. 1954. 引文格式1维护：冗余文本 (link) Aside from providing an excellent summary of the Britannica's history and early spin-off products, this article also describes the life-cycle of a typical Britannica edition. A new edition typically begins with strong sales that gradually decay as the encyclopaedia becomes outdated. When work on a new edition is begun, word leaks out and sales of the old edition effectively stop, just at the time when the fiscal needs are greatest: a new editorial staff must be assembled, articles commissioned, etc. Elkan Harrison Powell（英语：Elkan Harrison Powell） identified this cyclic fluctuation of income as a key danger to the fiscal health of any encyclopaedia, one that he hoped to overcome with his innovative policy of continuous revision. ^ The New Encyclopædia Britannica 15th edition, Index preface. 2007. ^ Burr, George L. The Encyclopædia Britannica: A Dictionary of Arts, Sciences, Literature and General Information. American Historical Review. 1911, 17: 103–109. doi:10.2307/1832843. ^ Fatally Flawed: Refuting the recent study on encyclopedic accuracy by the journal Nature (PDF). 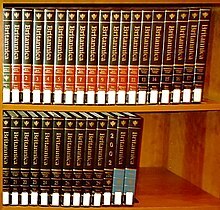 Encyclopedia Britannica, Inc. March 2006 [2006-10-21]. ^ Giles, Jim. Internet encyclopedias go head to head. Nature. 2005-12-15, 438: 900–901 [2006-10-21]. doi:10.1038/438900a. ^ Change: It’s Okay. Really.. 大英百科全书博客. ^ The Building of Britannica Online. howtoknow.com. [2005-12-30]. （原始内容存档于2007-09-27）. Einbinder, Harvey. The Myth of the Britannica. New York: Grove Press. 1964. ISBN 978-0384140509. Jacobs, Arnold Stephen, Jr. The Know-It-All: One Man's Humble Quest to Become the Smartest Person in the World. New York: Simon & Schuster. 2004. ISBN 978-0743250627. Kister, Kenneth F. Kister's Best Encyclopedias: A Comparative Guide to General and Specialized Encyclopedias 2nd. Phoenix, AZ: Oryx Press. 1994. ISBN 978-0897747448. Kogan, Herman. The Great EB: The Story of the Encyclopædia Britannica. Chicago: University of Chicago Press. 1958. LCCN 58-8379. Greenstein, Shane, and Michelle Devereux (2006). "The Crisis at Encyclopædia Britannica" case history, Kellogg School of Management, Northwestern University.